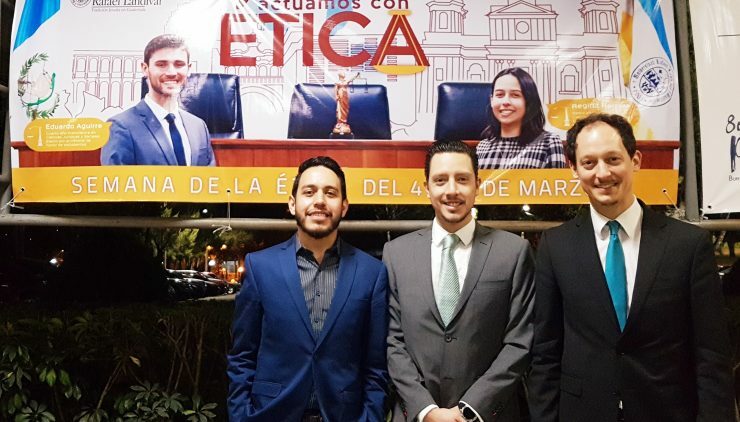 Latin American Policy Manager Jaime Chávez Alor participated in a meeting organized by Acción Ciudadana considering strategies to strengthen integrity in the business and legal sectors of Guatemala. The Vance Center and the Lawyers Council for Civil and Economic Rights are planning to participate with Guatemalan and other lawyers in designing a new legal framework to promote integrity in the legal profession. At the meeting, Acción Ciudadana’s new president Edie Cux García stressed the importance of the private sector in Guatemala’s anti-corruption efforts. Representatives of the country’s business sector underscored the importance of collaboration as a way of changing business practices, with integrity as an affirmative focus. John McKendrick QC and lawyers from QIL+4, GR Legal, among others, also participated in the meeting. Chavez also met with Gustavo Bonilla, Dean of San Carlos University’s Law School, and Alan Alfredo Gonzalez de Leon, Dean of Public Law of the Rafael Landivar University’s Law School, to discuss the Vance Center’s and the Lawyers Council’s engagement with law schools and universities to promote pro bono practice, public interest law, and legal ethics. With Claudia Murga, Executive Director of Fundación Pro Bono Guatemala (in formation), Chavez Alor followed up on various initiatives, including pro bono representation projects and the collaboration with AMAmericas. In a meeting with Ramon Cadena, Director for Central America of the International Commission of Jurists, Chavez Alor discussed opportunities for new projects in the country, related to the Guatemalan constitution, civil society and LGBT rights.